Hi everyone! good friends are hard to come by. My mom has a good friend, Donna. They have so much in common. and it's fun to watch them interact. Lots of laughing going on. Well, Donna has been very good to me and my Mom. She is a sweetie for sure. Mom and I have talked about taking Donna out to lunch to thank her for all she has done. We also talked about maybe giving her a quilt. I thought of a few that she might like. such a hard decision. Donna is a girly girl. So I wanted something pinkish, and girly and sweet. I had decided on one quilt top I have. but it just didn't seem right. Then when I finished the pinwheel quilt, yep, that was it!!! She was so excited and sooooo happy! I know, not really pink, but the background looks pink! And she loved it. 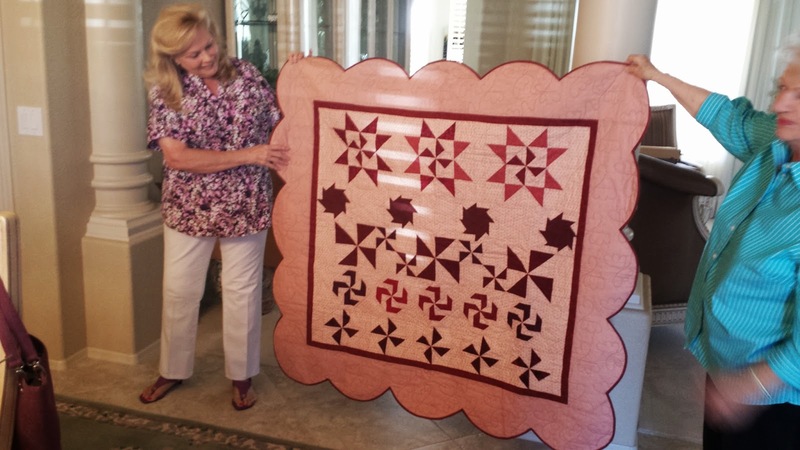 Doesn't it make you feel good when your quilt goes to a happy home!